Think Google is destined to tinker with neat hardware that no one ever buys, surviving on the fat of its vast and profitable advertising business? Think again. During the company's quarterly financial call today, plenty of breath was spent digesting cost-per-click and ad revenue figures, yet some heady praise was levied on the company's recent hardware endeavors as well. Google CFO Patrick Pichette repeatedly called the Nexus 5 a "very strong" performer for Mountain View, while Chief Business Officer Nikesh Arora said there is "strong interest in Nexus hardware." The Nexus 5, Arora noted, saw loads of reception, particularly during the holiday season. 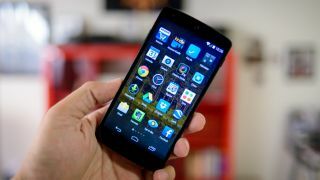 Now, neither provided sales figures for the new Nexus, so just how it stacked up to other Android handsets is unknown. However, it is likely customers responded well to its stock Android KitKat carriage and low, no-contract price point. Word on the street is Google may kill off the Nexus line next year, but if these company crows are to be believed, that tip may have missed the mark. Turns out the Nexus 5 wasn't the only hardware to get a shout out. Pichette also chatted up the company's $35 (£23, about AU$39) streaming stick, Chromecast. "Play hardware sales drove a big chunk of quarter-over-quarter growth," he said. "Nexus 5 was very strong for us, and the Chromecast was a best seller all quarter." Again, no hard figures, but the dongle that streams content from a mobile device or laptop to a TV was clearly a winner for the company. Pichette said both it and Nexus 5 saw "great momentum." Hardware, coupled with strong content and apps sales in the Play Store, helped jumpstart Google revenue over the last three months. Google will never turn away from its traditional breadwinner (ads), but as long as hardware and Play content/apps continue as some of the company's fastest growing segments, the company should continue supporting and improving them. Maybe it will start by expanding the regions where Chromecast is sold? You can catch our full Nexus 5 review right here!